Achieve a fast, reliable internet connection and optimize your home, games console, or office network performance with your new KabelDirekt Cat6 Ethernet cable. Full-duplex mode offers more bandwidth, enabling data to be sent and received at the same time, resulting in less congestion and better overall network performance. Ideal if you want to transfer large (or many files) when you perform backups. It’s easy for you to connect to modems, routers, and switches; link computers, network printers, gaming consoles, and patch in devices. Constructed with UTP (Unshielded Twisted Pair) of oxygen-free copper wiring, they’re corrosion resistant for long-lasting durability. And provide a consistent internet connection for your home or small office network. With no stiff shielding material inside, your KabelDirekt Ethernet cable is thin and flexible, making it easy to work with and install. Twisted pair construction (UTP) prevents external interference and allows fast data transfer over long distances. We pride ourselves on the level of customer service you receive. That’s why our customer service starts before your cable’s made. 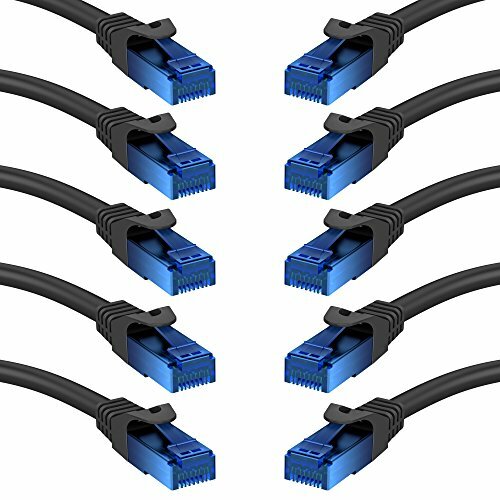 Sourcing the best materials, our high-tech manufacturing techniques, meticulous quality control, and German efficiency means you receive an ethernet cable with unmatched quality and reliability. We’re so confident you’ll love the results, we’ll give you an 18-months money-back guarantee.